The National Institute for Health and Care Excellence offers guidance for doctors to advise people who are trying to quit smoking - that e-cigarettes are helpful tools when trying to quit. However, emerging evidence suggests that e-cigarettes as actually used, actually depress, not assist cigarette smoking cessation for most users, and are a gateway to youth smoking. So, should they be recommended? Experts debate the issue in The BMJ today. Smokers are asking their doctors for advice on e-cigarette use, they want to vape, and e-cigarettes can help smokers quit, argues Paul Aveyard, Professor of Behavioural Medicine at University of Oxford, and Deborah Arnott, Chief Executive of Action on Smoking & Health. E-cigarettes are as effective as nicotine replacement therapy (NRT) in quitting smoking, and many people choose e-cigarettes over NRT. E-cigarettes are popular quit smoking aids, which leads to increases in quit attempts and quitting as a whole in England and the USA, they explain. Some fear that addiction from tobacco to e-cigarettes leads to continued vaping which may be harmful. But they say, "for most vapers, the uncertainty around harms is largely irrelevant because vaping will be short term." Some young people do experiment with e-cigarettes, but only one in several hundred young people who have never smoked use them more often than once a week. At a time when e-cigarettes have become more common, smoking among young people has fallen to record lows, so the risk of picking up smoking must be low, if it exists at all. Concerns have been raised about the tobacco industry's involvement in the e-cigarette market, however, "the evidence suggests that e-cigarettes are not benefiting the tobacco industry because the rate of people smoking is falling" the authors say. "In the UK, e-cigarettes are part of a comprehensive anti-smoking strategy that protects public policy from the commercial interests of the tobacco industry." The UK health policy "promotes vaping as an alternative to smoking and has consensus among the public health community with the endorsement of Cancer Research UK and other charities, medical royal colleges, and the BMA," they conclude. But Kenneth Johnson, Adjunct Professor at the University of Ottawa, says recommending e-cigarettes for quitting smoking as currently promoted and used is irresponsible. The overall evidence is that e-cigarettes as actually used depress, not assist cigarette smoking cessation. New research is replacing optimistic speculation with evidence that indicate the limits and hazards of e-cigarettes as a smoking aid, he says. 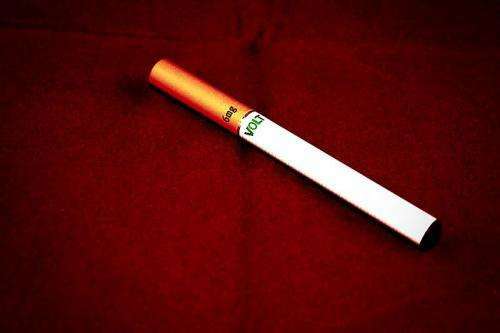 E-cigarettes have a serious public health risk of addicting new generations of young smokers, he adds. In a 2016 study among English youth (11-18 years of age), e-cigarette users were 12 times as likely to initiate smoking (52%) as never e-cigarette users. "They [tobacco companies] have a long history of aggressively using their economic and political power to profit at the expense of public health," he adds. British American Tobacco has big plans for expanding the recreational nicotine market with e-cigarettes - and cessation is not part of the game plan." The net effect of e-cigarettes on smoking cessation is negative, high levels of dual use undermine harm reduction, and gateway risks for youth smoking initiation are a demonstrated danger. Recommending e-cigarettes for smoking cessation, as currently promoted and used, is irresponsible," he concludes.